Come take a look at some of my work at the Halloween Art Exhibit in Chicago. Clocks and paintings on Display all month long in March. It Ain’t Over ‘till the Jack O’ lantern sings! 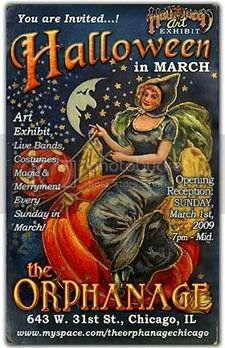 The Annual Halloween Art Exhibit & The Orphanage team up for “HALLOWEEN IN MARCH”, a celebration of art, live music, magic and costume ball all in the Halloween vein! For years, this South side gallery gem known as “The Orphanage” has been host to artists of all media and performance, regularly featuring showcases every Sunday in it’s spacious gallery. This March, the Orphanage acknowledges it being halfway to Halloween with this month long tribute to world’s greatest play day. Chicago’s own “Annual Halloween Art Exhibit” will bring the best of its national showcase of Halloween Art to haunt the house and horrify the halls. Well known spooky artists include: Scott Jackson (Megadeth, Rock’n’Roll comics), Chad Savage (Sinister Visions), JoJo Baby (Clive Barker documentary), Eric Pigors (Toxic Toons, Disney) Dan Brereton (Nocturnals) along with top & upcoming talents from all over the country. A great line-up of Music performers bringing their haunting riffs all month long include: Pete Jive & Juice Digits, Merlin, Allison & Victor, Donna Frost, The Infusions, Ami Saraiya, Anna Soltys, One Drum Shoe, Lies Like Me, Pat Dougherty & The Second-hand Opera, Shining Through, Adalia, Brianna Lane, Cahalen David Morrison, The Belmondos, EaVil and more to be added! All of this escalating to the grand finally, when on March 29, The Wolfs bane’s in full bloom with the “Halfway to Halloween Costume Ball” with dancing and dark magic from “Fitzgerald’s Realm of Magic”…need we say more? 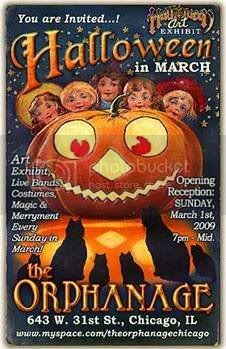 Come join us for tricks & treats this March when the Orphanage & The Annual Halloween Art Exhibit give you more reasons than one to get all dressed up & come on out! Visit http://www. myspace. com/theorphanage or http://www. myspace. com/halloweenartexhibit for performance schedules and more information.